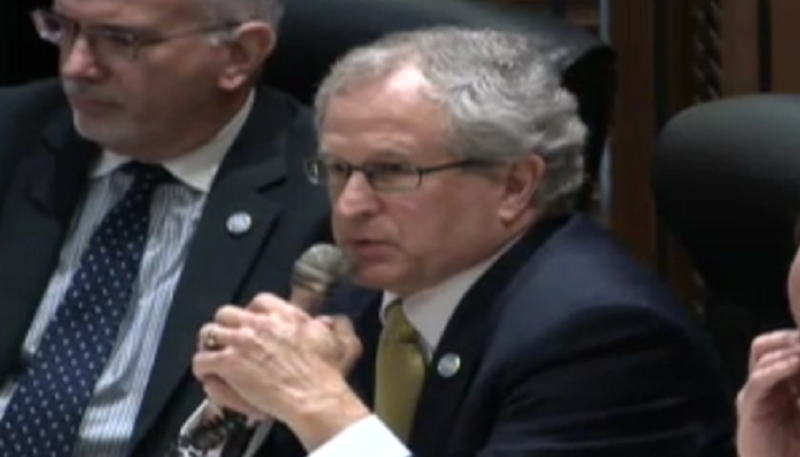 Section 5 of Rep. Mark White’s (R-Memphis) bill, HB660, would have allowed the governing boards of state colleges and universities to grant in-state tuition to illegal immigrant students. Despite amending his bill to remove Section 5, the bill failed for lack of a majority in the House Education committee this week. If the Education committee follows the Permanent Rules of Order of the Tennessee House of Representatives the 110th General Assembly, White’s bill will not be revived for a new vote by the committee. White has put his bill back “on notice” for the committee’s meeting on Tuesday, April 18th. However, before the committee can vote on the bill again, a motion for reconsideration would need to be offered and passed. It has been confirmed with the House Office of the Chief Clerk, that a motion to reconsider White’s bill would have to be offered by a committee member of the “prevailing party.” It was also confirmed that when a bill fails to achieve a majority vote as in this case of the 6-6 vote on White’s bill, the “prevailing party” would be someone who voted against the bill. Should any of the committee members who voted “no,” move to reconsider the bill, it would only take a simple majority of seven committee members to revive the bill. Republicans Jimmy Matlock, Terri Lynn Weaver, Ron Lollar, Roger Kane, Debra Moody and Dawn White, voted “no” on the bill. Voting “yes” were Republicans Eddie Smith, Mark White and Harry Brooks, along with all Democrats on the committee. Democrat Rep. John DeBerry was absent when the vote was taken making it more than likely that the bill would have passed had he been present. White could have elected to roll his bill until all committee members were present but chose instead, to go forward with the vote. It was also confirmed that because Rep. DeBerry was absent and did not vote on White’s bill initially, DeBerry is not eligible to offer a motion to reconsider. If the House were to pass White’s amended bill, the companion bill carried by Sen. Todd Gardenhire and passed by the Senate Education committee, could restore the disputed Section 5 of White’s bill allowing the higher education governing boards to give in-state tuition to illegal immigrant students. I e-mailed my senator about this abomination back before it was voted on. He gave me an elaborate response about how it would be unfair to not provide those poor ILLEAGALS from receiving subsidized in-state tuition. That after they have been provided a free secondary education. An education that dumbs down classes and costs a bundle for he ESL classes. Not sure why my senator is not more concerned for us citizens. I will seriously consider voting for his opponent in the next election.